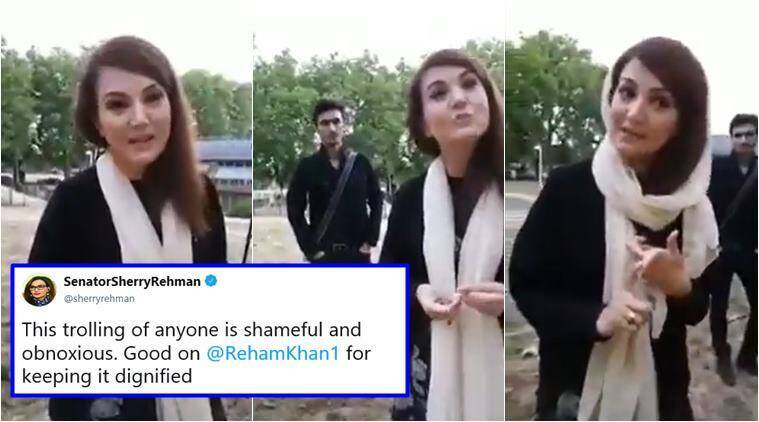 While the unknown woman kept slamming Reham Khan, accusing her of being "jealous" and insulting Imran Khan's present wife Bushra Maneka -- she was seen to remain visibly calm and tries her best to answer the heckler. Reham Khan, the journalist and former wife of Imran Khan, has been trolled by the future Pakistan PM’s supporters ever since she released her book about her nine-month marriage to the Pakistan Tehreek-e-Insaf (PTI) chief. During a recent interview at a park in the UK, she was heckled by a woman. The video, shared widely on social media, shows the unknown woman slamming Khan, accusing her of being “jealous” of Khan’s present wife Bushra Maneka. During ths entire interaction, Khan is visibly calm and tries her best to answer the woman. “You can talk to me or talk with me,” she politely says to the woman. In another video from the same incident, her son, Sahir Rehman, is seen trying to intervene and talk to the woman but is seen walking off after the argument escalates. Soon, Khan too realises that the woman is only there to attack her and not to seek answers to her questions. Khan then walks away and talks to her interviewer. People on social media are sharing the clips stressing that even if they do not agree with Khan, people have no right to disrespect her and invade her privacy. Khan also got support from Pakistan People’s Party leader Bakhtawar Bhutto-Zardari who said said it’s not okay to harass others and lauded Khan for her patience. The woman harassing @RehamKhan1 is an embarrassment to women. Exactly the kind of PTI cult followers who will tweet to Jemima all day to come to PK, and tell Reham her chapter is closed. The UK has harassment laws, I sincerely hope she is refrained from ever doing this again. I am impressed by her composure and class. The questioner was just trolling her. This is exactly what I absolutely loathe about PTI supporters! They think Imran is some supreme, godly leader bestowed upon us straight from Heaven. Disgusting! I think #RehamKhan came across as more educated, calm while handling that psycho. What do you think about this incident? Tell us in comments below.